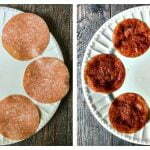 Add the salami slices to a microwave plate. Microwave for 1 minute. Then in 15 second intervals cook again until they are darker in color but not burnt. Mine took 1-2 minutes. Let cool while you chop your vegetables. Assemble salami with lettuce, cheese, sour cream, tomatoes and jalapeños.